Arndre Martin Wins the $400 Deep Stack Event! Arndre Martin is the winner of the $400 NLHE Deep Stack event. He takes home $27,500, the World Poker Finals Trophy and the watch! Salimbene has a pair of sevens but Martin has top and bottom pair. The turn is the [Kd] and the river comes the [6c]. Nick Salimbene is eliminated in 2nd place for $23,587. Guiseppi Betta raises to 260,000 from the small blind and Arndre Martin three-bets to 740,000. Betta moves all-in for just under 2,600,000 and is called by Martin. The board runs out [Kc][7s][5c][7h][9c] and Martin pairs his five to win the pot and eliminate Betta in 3rd place for $20,000. The final three players in the $400 Deep Stack event have come to an agreement to restructure the final three spots. The board runs out [Jc][9d][5s][Kh][9c] and Betta makes a straight to take the pot. Slightom is eliminated in 4th place for $10,690. The board runs out [Qs][8c][5h][Ts][7d] and Martin improves to a set to in the pot and eliminate Campo in 5th place for $8,295. 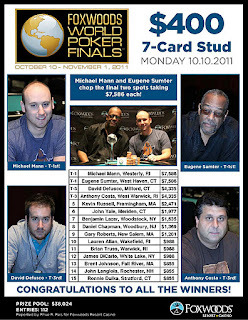 We had a total of 82 players in the $400 Limit Hold 'em event at the Foxwoods World Poker Finals. The board runs out [Kd][Qc][9s][Jh][Td] and Salimbene makes the ace high straight to win the pot. Stefanski is eliminated in 5th place for $6,652. David Stefanski raises to 90,000 before the flop and Anthony Campagna moves all-in for 340,000 total. Nicholas Salimbene then reraises all-in from the big blind and Stefanski folds. The board runs out [Qd][7d][3h][Ks][Ts] and Salimbene's aces hold to eliminate Campagna in 7th place for $5,399. Campo holds the lead and looks to knock both players out until the board runs out [Qd][8h][3c][5d][6c]. Betta makes a set of queens to more than double up and Frank Williams is eliminated in 8th place for $4,304. The board runs out [Ac][8h][3h][Td][7s] and Martin wins the pot, eliminating McAvoy in 9th place for $3,537. Matt Millea and Peter Campo both check the [As][8d][2h] flop and the [7s] comes on the turn. The river is the [Jd] and Campo wins the pot to eliminate Millea in 10th place for $2,269. We have reached the final table of the $400 No-Limit Hold 'em Deep Stack event. We had a total of 418 players in the $300 NLHE Deep Stack Bounty event at the Foxwoods World Poker Finals. Day 2 of the $400 Deep Stack Now Streaming Live! 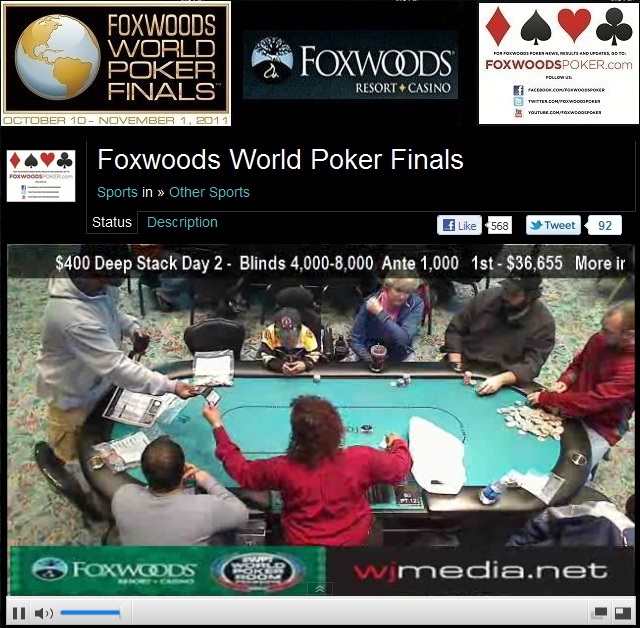 Day 2 of the $400 N0-Limit Hold 'em Deep Stack event is now streaming live. Just click "Watch LIVE Video" at the top of the page to watch all the action from today's event! Day 2 of the $400 Deep Stack event is about to get underway at noon. There are 45 players remaining and the blinds will be 4,000-8,000 with a 1,000 ante for another 15 minutes. $300 Deep Stack Bounty Event Underway! The $300 Deep Stack Bounty event is now underway. Players start with 15,000 in chips and the levels are 30 minutes in length. You earn $50 for every player you eliminate. Al Borges Wins the $600 Deep Stack Event! Congratulations to Al Borges, winner of the $600 Deep Stack No-Limit Hold 'em event at the Foxwoods World Poker Finals. He takes home $37,543 and the World Poker Finals trophy! Just before heads-up play begins, Carlos Solerti and Al Borges decided to chop the remaining prize money and play it out for the trophy. Just a few hands later, the tournament came to an end. Solerti has top pair with a queen high flush draw while Borges holds bottom pair and a king high flush draw. The [Ad] on the turn seals the deal for Borges as he makes the nut flush. The [As] falls on the river and Solerti is eliminated in 2nd place for $37,543. The board runs out [Jd][8h][6h][Kd][3c] and Borges pairs his king to win the pot. Callucci is eliminated in 3rd place for $28,000. The board runs out [Jh][Js][6c][4c][Ts] and Solerti pairs his ten on the river to win the pot. Borders is eliminated in 4th place for $20,000. Play has ended on Day 1 of the $400 Deep Stack event with 45 players remaining. Play will resume at noon. 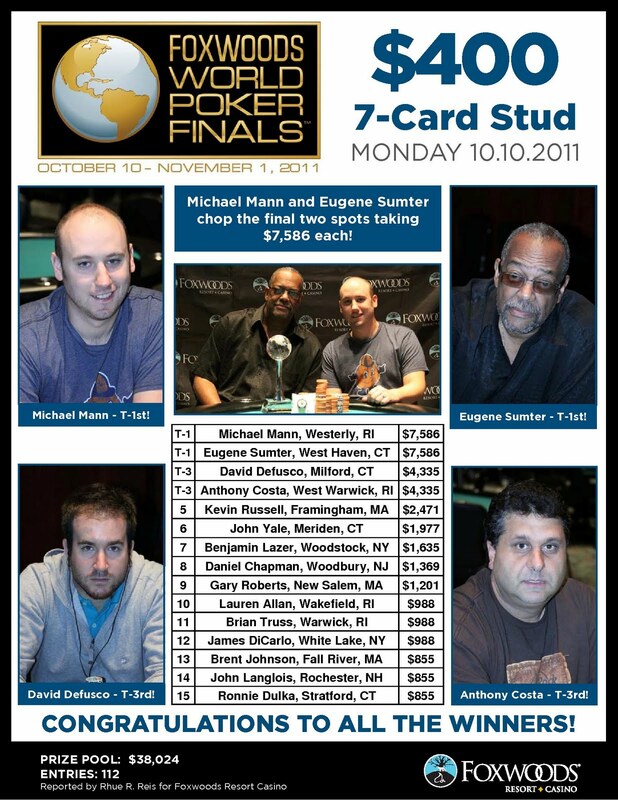 The end of Day 1 chip counts and Day 2 seating assignments will be posted shortly here on FoxwoodPoker.com. The turn is the [8d] and the river comes the [8c], filling Solerti up and eliminating Smith in 5th place for $20,000. Both players flopped top pair but Borges has Kalaitzis out kicked. The turn is the [Js], giving Kalaitzis a flush draw but the river comes the [8d]. 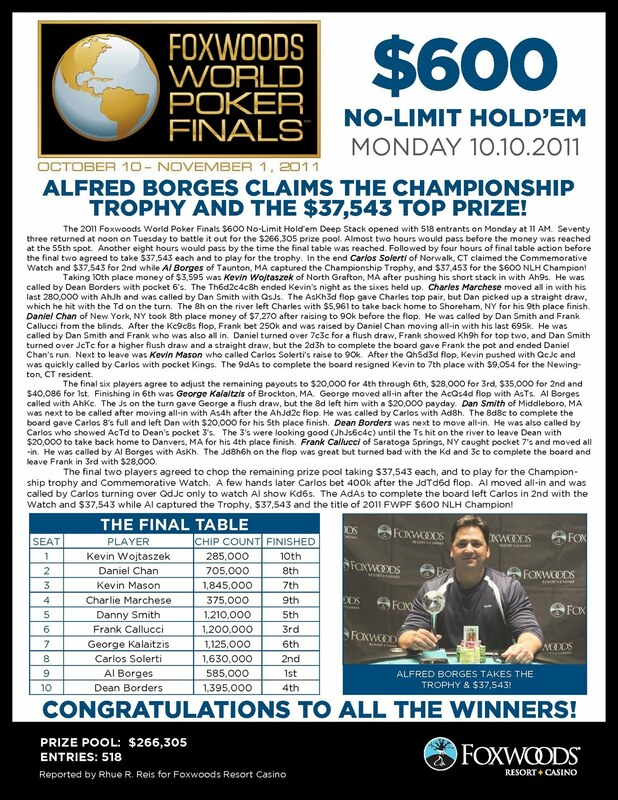 Borges wins the pot and Kalaitzis is eliminated in 6th place for $20,000. The final six players in the $600 Deep Stack event have decided to restructure the payout.